Technology Update: Laptop Hard Drive to SSD Drive Conversion. For the last week I have been hearing a knocking sound from my travel laptop computer (Lenovo ThinkPad W510). It actually sounds like a car knocking when climbing a hill when using low octane fuel. When I have heard this sound before, it was a precursor to the hard drive failing (often catastrophically). My last backup (disk image) was 2 weeks ago, so the first thing I did was make a new backup. I would love to be able to do incremental backups, however my Lightroom catalogs contain over 500K images. Even though I only keep normal sized preview images in the catalog, it is a lot of small files. Because of the large number of files, backups can take days. My workaround it to make a full disk image backup. This is sector based, not file based and only takes 2-3 hours. I actually planned to replace this computer with a new Lenovo W520 computer back in August, however Lenovo failed to deliver the computer on time before I left for the Fall 2012 Semester at Sea Voyage. UPS tried to deliver the computer after I left. I ended up having some long phone calls to Lenovo from the ship (at $2.50/minute). The computer was returned, and ultimately I was refunded for the cost of the computer (but not the phone calls). So what to do with the current computer? I decided to try to upgrade the current computer with a new 512 GB solid state (SSD) hard drive, and a second 1 TB hard drive. The second drive would go into an Ultra Drive slot, replacing the CD/DVD drive. This should give the current computer some additional life, and having a primary SSD drive and a second data hard drive some improved performance. I ordered a new 512 GB Crucial solid state (SSD) hard drive, a 1 TB Seagate hard drive, and an Ultra Bay hard drive caddy via Amazon. I have Amazon Prime, so featured Amazon prime items get free 2-day delivery. I was pleasantly surprised when the two hard drives arrived in less than 24 hours via US Mail (USPS). The Ultra Bay caddy is coming from China, so will take longer. 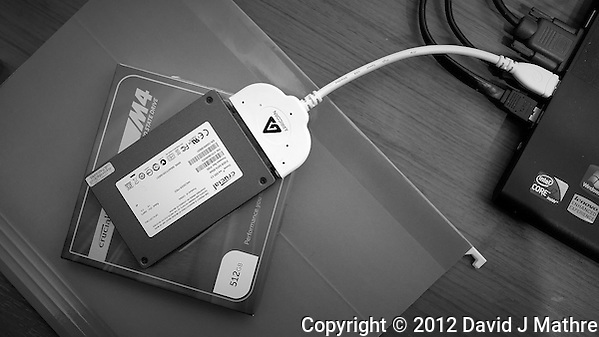 The Crucial SSD came with Apricorn Data Transfer software and a USB/Hard Drive connector to make an image of my current hard drive on the new SSD hard drive. The process was relatively simple, and after 4 hours I had an identical image of my current hard drive. Tomorrow, I will swap the hard drives and see if the process works. One thing that I need to worry about is that some software in an “ET calling home mode” compares processor s/n, hard drive s/n, etc to decide if the software is pirated. I have heard of some folks finding out that some of their programs no longer work because the software thinks that it has been illegally copied. The other thing that I need to check into when I have the computer open is the amount of installed RAM. I purchased this computer with 16 GB of RAM (since I was going to be using Windows 7 Pro 64-bit). I was surprised to see Task Manager only indicating 8 GB installed — Strange. Did some of the memory in the computer go bad, and needs to be replaced?